Supply Craft – Offers supplies for many crafts. Include decorative painting, glass, stencils, bucilla, and needlework. – Offers supplies for many crafts. Include decorative painting, glass, stencils, bucilla, and needlework. 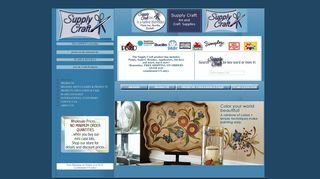 Supply Craft, Inc. is an international wholesale distributor of arts and crafts products. We are a full line distributor of Plaid Enterprises, Bucilla and Etchall, Inc.
Supply Craft was founded in the year 2,000 by Belinda and Mel Harris, the present owners of the web based business. We are located in the Atlanta, GA metro area and have close access to Plaid Enterprises, our main supplier. Our recent additions to our product line includes Etchall, our glass etching line and Belinda Harris Arts where our customers can purchase art packets and enroll on Belinda’s fine art classes. We specialize in online sales to small retailers, artists, art teachers and crafters. We also service several school systems and other governmental institutions. Our niche is to customers who want to take advantage of our low wholesale prices, but do not want to pay the huge minimums that are required by our suppliers. Our customers can shop our website and find all of Plaid and Bucilla products, many of which cannot be found in retail stores and other websites. We also serve customers world-wide who do not have access to Plaid’s product line. Our customers like our prices that are consistently some of the lowest on the internet. Most of our US customers take advantage of our free shipping offer for orders over $125 within the continental USA.